What's a long-arm and do I need one? Abby answers all your questions. Over the past couple of months I've posted here about my adventures quilting by hand and with my new Juki 2010Q (you could call it a mid-arm quilter/sewing machine). After that I thought it would be fun to talk about long arm quilters. Since I don't own one I reached out to the gals in our facebook group and Abby West (we're fast becoming friends, lol) volunteered to answer all my questions and share pictures of her long-arm quilter and her studio. Yay! We're so lucky. This is Abby. She makes beautiful quilts and blogs about them at Color Bar Quilts. She also takes commissions and although she is modest about it, I'd say she's amazing! I started with Free Motion Quilting (FMQ) on my domestic and loved it! But the small size of my domestic machine was limiting my projects. I was also having trouble with the stress on my body of pulling/pushing a large quilt through my machine. I started researching long arms, everything from frames to hold my domestic to $30,000 machines. My must-haves were a sturdy structure, not having to baste quilts, easy to maintain, easy to use, great customer service and sticking to my budget. I also wanted a machine with no less then 18” of throat space and had a needle speed of minimum 2000+ stitches per minute. …you have the room. A long arm frame takes up a lot of space, generally 10’ or 12’ long and 3’ to 5’ deep. You also need to allow for space to move around your machine; you don’t want to keep running into it or have the carriage hit the wall. If you are space limited, there are a few sit down models with much smaller tables; you prepare your quilts as if you were quilting on a domestic. …you can stand for long periods. It takes many hours to finish a quilt, plus time to practice every day. This really has to be high on the list of things to consider -- I have read that long arm owners have trouble with neck and back pain. To make it more comfortable to use, I raised my machine up to a height where I could see behind the needle without bending my neck. I purchased my Juki TL-2200QVP in November 2013. Direct Drive Motor System - No belts to slip off the motor. It was very easy to setup on my own, though I needed a friend to help lift the head onto the carriage. The instructions provided by Grace for the frame setup were very easy to follow. The documentation wasn’t clear about the final tension adjustments, but a quick call to the store’s Customer Service cleared this up. I find the Juki is very easy to use and has smooth movement. With the frame height adjusted to my height, I find that I can sew for hours without any trouble. 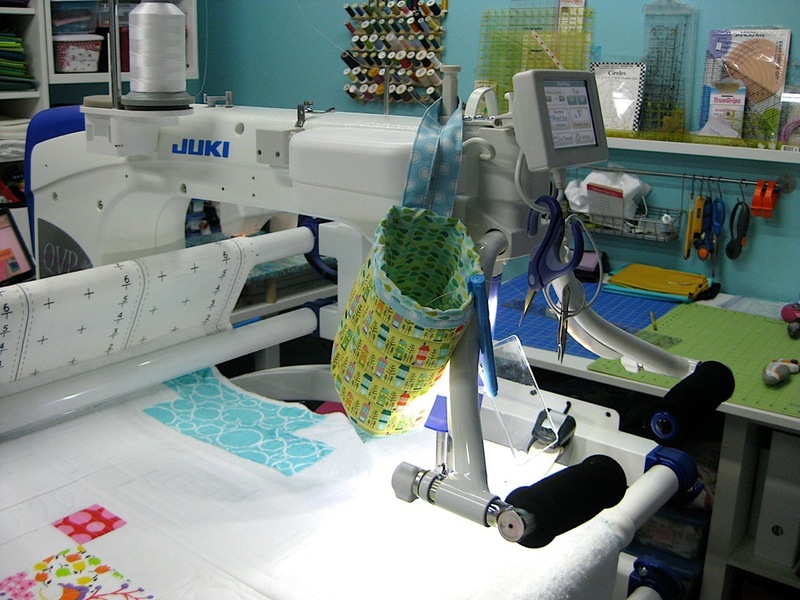 I test-drove several machines before deciding on the Juki. The Gammill and APQS high-end machines were such a dream to use. I did not have the opportunity to test drive the Juki, but I don’t regret my purchase. I find it comparable to the more expensive machines and it kept me in budget. I do wish I had channel locks for the frame for straight-line quilting but this option is not available for the frame. The 2200QVP has a 5 ½” wide base while most other machines are only 3” or 4” wide. Juki does not offer a base extender plate, but I did find one online that is custom-made for the machine and I love it. The base extender gives me 11” of support for ruler work and really helps the quilt move smoothly under the needle. I loaded my first quilt using pins to attach to the leaders and decided that was just too time consuming and made my fingers hurt, so I invested in Leader Grips to be able to snap my backing fabric to the cloth leaders. I float my top and batting, allowing me to load a quilt quickly. I purchased the 10’ frame, a limitation of my room dimensions. I found it was a bit tricky when I loaded a 90” quilt on the frame; if I get more space I will add the 2’ extension. Don’t get discouraged after a few uses – it takes lots of practice! My skill is improving after 20 quilted projects. Learn all you can from online forums, videos, Craftsy classes. Don’t be afraid to ask questions. Consider the additional cost of items you need to get started, such as cloth leaders, thread, batting, bobbins, needles, etc. I would not recommend buying a lot of thread in the beginning; try a few brands to see what works for you and your machine. Wow, didn't she spill the beans! I'm so grateful to Abby for taking the time to share all of that information with us. She answered questions that I hadn't even thought of yet. I love her Juki TL2200-QVP and hope that someday I'll have the room (and budget) for one. Be sure to visit Color Bar Quilts to see more and keep up with Abby's beautiful modern quilts. Lucky for us, she's active in our SewCanShe facebook group so if you have any questions or comments just post and I'm sure she'll respond.